This raw, fictionalized history is made exciting by a enthralling plot. This sweeping historical epic dives into a true story of political strife in the year 741 AD. 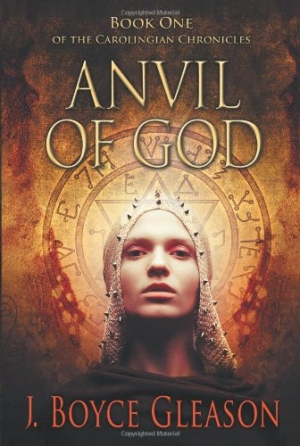 The first of a planned series, Anvil of God will capture the attention of Medieval history fans with its well-crafted dialogue, action, and romantic subplots. When Charles the Hammer, who ruled over much of Europe in the eighth century, dies abruptly, his four children—three sons and one daughter—rebel against his will, scattering across the continent and inciting political chaos. Each with his or her own loyalties—to the state, to the Catholic Church, to paganism, and to an enemy lover—the siblings are driven by their personal oaths rather than their ambition for the throne. This is, in part, what makes author J. Boyce Gleason’s story of royal complexities compelling—along with the characters themselves, of whom no one is named the main protagonist. It is the daughter, Trudi, whom the story most follows, however, since who she chooses to marry will mean life or death for the Frankish dominion. Her determination and independence are admirable, but she—as well as the other characters—could be more fully developed, as she is fairly single-minded in her striving. The cover gives the impression of the fantasy genre, but this is no magical world; it’s raw, fictionalized history made exciting by a enthralling plot. The cliffhanger at the end will have fans waiting impatiently for the next in the series.